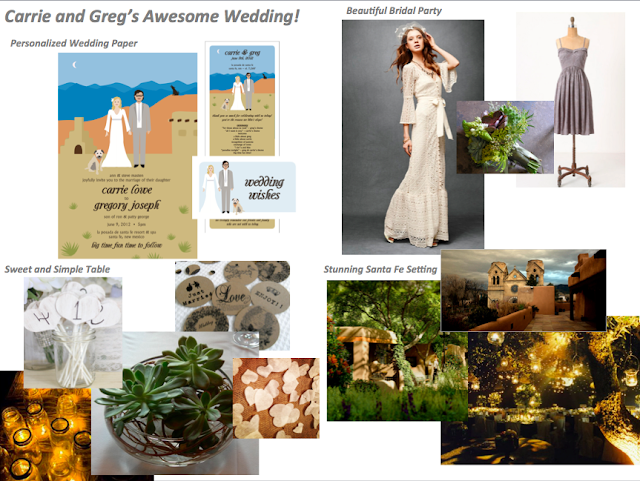 Earlier this year I had the honor of helping my good friend Carrie plan the décor for her June wedding in Santa Fe. I don’t know too many women who would turn down an offer to help their friend dream up wedding ideas, and I’m no different! Despite not having experience designing weddings other than my own, I was more than excited to give it a shot and hopefully help ease the planning stress for my busy friend. 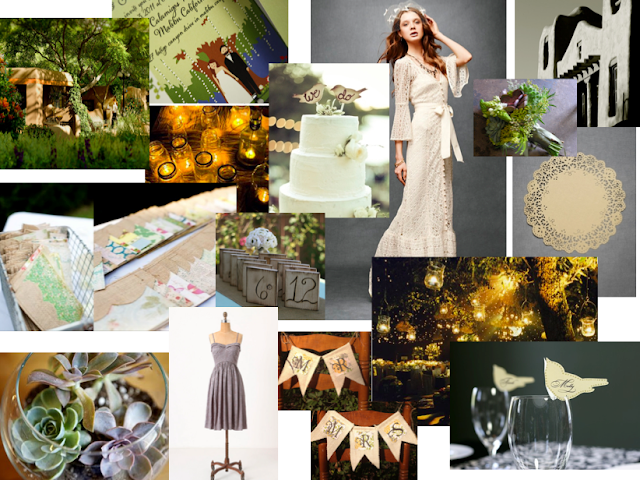 Carrie already knew she wanted a ‘bohemian rustic’ feel to the décor and had saved a number of inspiration images. 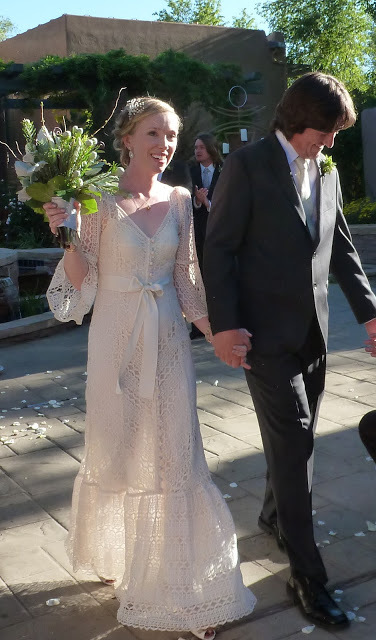 She had also chosen a gorgeous bohemian lace dress from BHLDN. 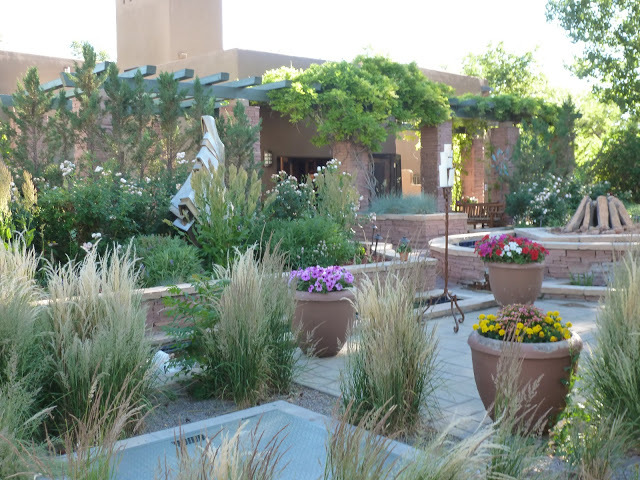 The outdoor Santa Fe setting was already going to be beautiful, so the décor could be fairly simple. In addition to the table décor, she wanted to hang a number of mason jar candles from the trees and buildings around the reception area. Above all, Carrie wanted the wedding to be FUN! Talk about a gorgeous bride! Carrie specifically wanted me to help with the paper elements of the wedding – the invitation, programs, table numbers, guest book, etc. She also wanted to spend wisely and was very open to finding unique (and relatively inexpensive) items on Etsy. 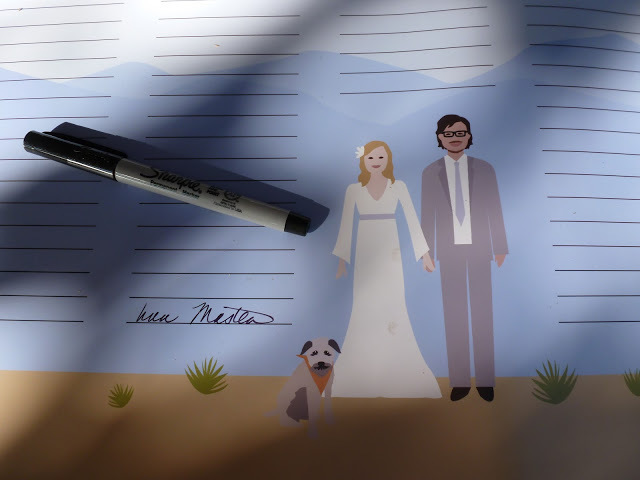 The invitation sets the entire tone for the wedding, and doesn’t this custom illustration of the couple just scream fun? Not to mention it promises “big time fun time” at the bottom. 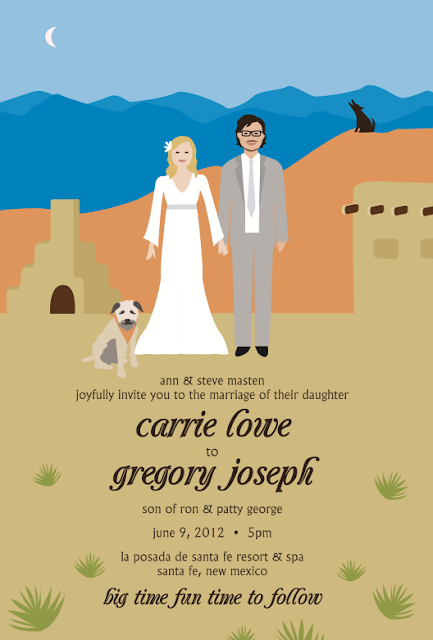 😉 I was thrilled when Carrie chose this design from the different invitation options I had suggested. 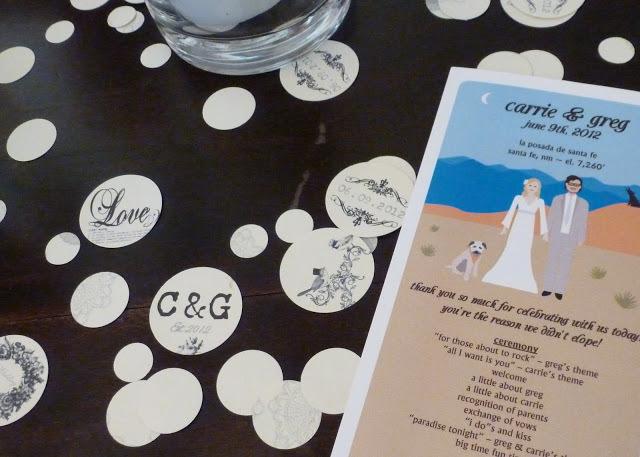 Carrie worked with Etsy seller Loo Bird Press to get the feel just right. I love the custom illustration trend in wedding invites (see Rifle Paper for some other great examples). So not only was this invite fun, it was super on trend. Good work, Carrie! 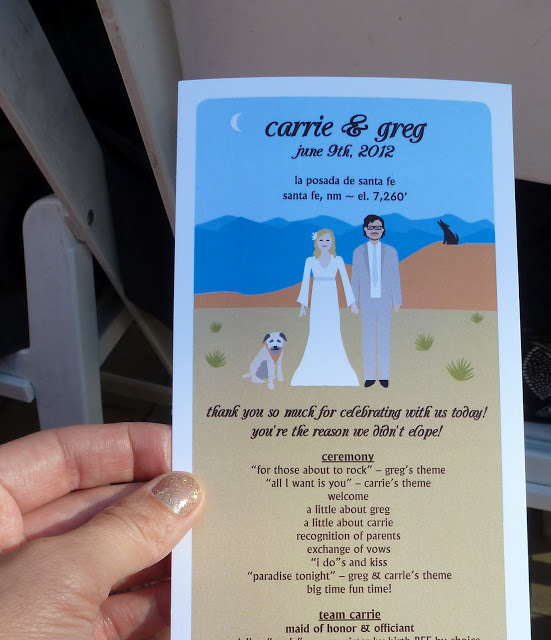 The great part about the invite choice was that Loo Bird Press also did other custom wedding décor, so Carrie ended up having her make programs, a guest book poster, and wedding wishes using their illustrations which really tied it all together nicely. 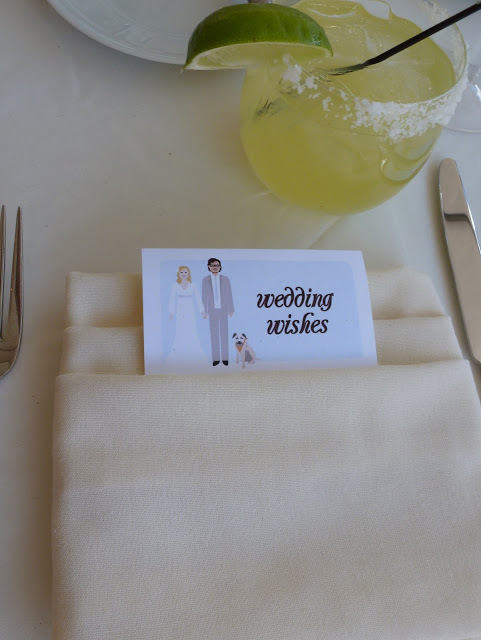 For the wedding wishes, each guest to wrote a note to the couple that they would open the year of their anniversary that corresponded to the guests’ table number. 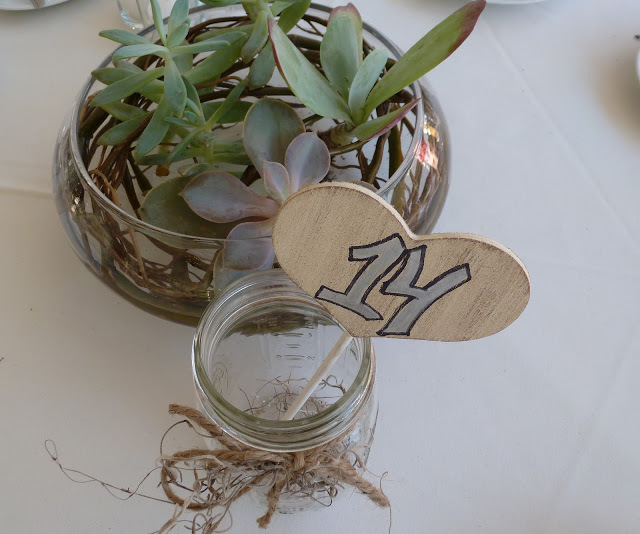 Carrie chose a mason jar with these simple rustic heart table numbers from Morgann Hill Designs. Guests put their completed wedding wishes in the jar, so it served dual purposes. 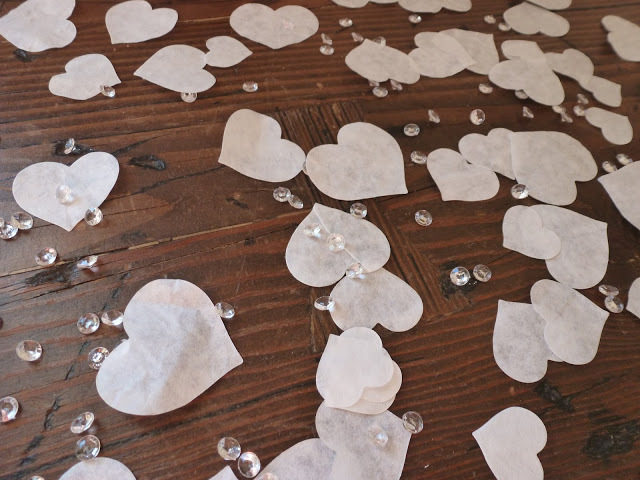 Carrie had also asked for some confetti options to add a little interest to the cocktail and serving tables. I particularly like these vintage custom ones she chose from Etsy seller Sweet Pea Sunday and the vellum hearts are from French Market Events. It is incredible how many unique things you can find on Etsy – there are endless options for every aspect of the wedding and every wedding budget. 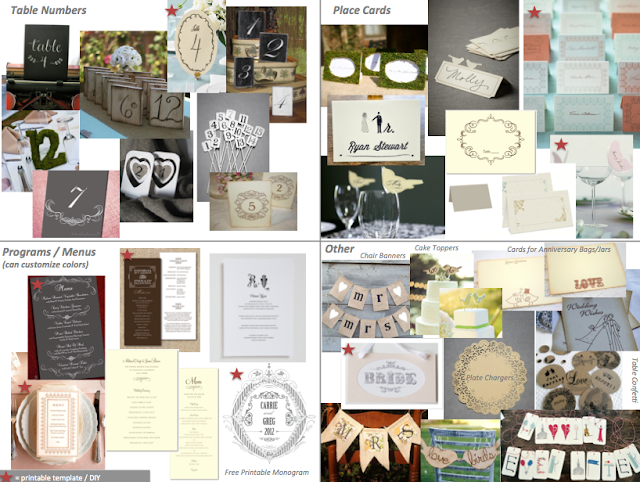 Better yet, Etsy just redesigned it’s wedding section. If you’re a bride, you must go check it out. While I don’t see myself becoming a wedding planner, it was fun giving her options and seeing how she chose to make them her own. The wedding was beautiful and above all SO FUN!